How nice it is when everything goes just to plan;not something always easy to achieve in horse racing! But that was just the case with Danigree at Hamilton on Tuesday with the six-year-old enjoying a lovely run throughout under the guidance of Jarrod Fry. Settling midfield with plenty of cover, Danigree was quickly into the clear straightening, looming up at the 200m - losing concentration slightly late - but really digging deep when it mattered; his half length victory a soft one. "It is always good when thinks work out like that," Fry reported, adding that when Danigree "gets into his right grade he is always very competitive." "He had a beautiful run though he did switch off a little bit when he got to the front but he got the job done ." "He has only got a short sprint so I kept that in mind, he travelled up to them so easily that I was able to hold that in the locker and put it into use when we needed it." 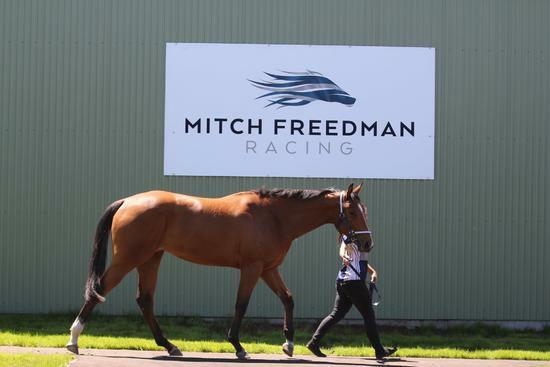 Mitchell was happy to see Danigree being well, noting that "he can be a bit tricky at the start, sometimes he jumps well, sometimes he doesn't but he did today and was well piloted early which enabled him to loom into the race at the right time." "It was nice to knock off Don Dwyer's horse," he joked. "He just pipped us in the first race (debutant Heading North going so close) so it was good to get the upperhand this time, we finish the day level!" Mitchell is unsure where Danigree heads to next with the six times winner not always easy to place having found BM64 level just a little beyond him at times - "but we will try to find a soft one."